The Blackwing Diaries: "A fine thing--I've become the father of a breakfast!" "A fine thing--I've become the father of a breakfast!" I drew this morning from memory of "Mrs. Sylvester"; of course, she's actually better-looking and funnier than this. The ever-busy provider of terrific cartoon clips Thad K posted several Freleng excerpts on his blog recently as a kind of proof's-on-the-screen defense of Freleng's value as a great cartoon director. I happen to agree with that assessment, and rate the cartoons Friz did among the top, funniest and most appealing shorts ever done. "A Mouse Divided"(1953) is a stellar example of what this director's crew could do with very simple material. 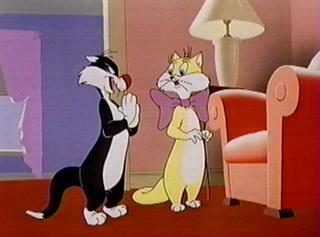 Every bit of this 7 minutes is used to great effect--and unlike some of Chuck Jones' more bitter moments, Freleng(or perhaps credit should go equally to his writer, Warren Foster, and his animators)manages to put some pretty nasty lines in Sylvester's mouth without making him unlikable, even when he's disgustedly mocking his wife's crying over her lack of kittens! That takes finesse--and it manages to make it hilariously funny: you believe that a talking cat is telling his cartoon-cat-wife to go to hell and leave him alone--and she's mitigated by her brief aside before she wakes her hubby up from his napping: "Lazy good-for-nothing!" before affecting a plaintive, sugary tone. Just another happy suburban couple. Of course, a drunken stork, simply because he's too hung over from a night at--where else?--The Stork Club--decides to dump his baby cargo on the first mother of any species that pops her head out of a mail slot. The lucky recipient is Mrs. Sylvester(the alternate universe here employs a couple of fairly "realistic", floor-sleeping cats living in a human-sized house, who also dress up and go out "shopping" as well as pushing a baby buggy--somehow, it all makes sense. Credit the characters and again--that fast-paced 7 minutes). Only problem--their new son is a mouse; arguably the cutest little baby mouse ever animated--cuter even than a Jones creation--and given some gorgeous, finely observed baby-business by one of the animators--as Sylvester is doing the ol' "preparing the mouse for a sandwich routine. So adorable is this baby mouse(somewhat unconvincingly voiced by Mel Blanc--he sounds just a widdle bit like Bugs Bunny)that even ravenous Sylvester, who's been acting like a starving man at Chez Panisse, is won over--and decides to take his "widdle man" out for a stroll. Cue every tomcat within 10 miles, and the rest of the cartoon--a switch from the sort of stuff Sylvester usually did to Tweety, only here he's the hero: a staunch defender of his mouse son. This doesn't even address the music--typically brilliant job by Stalling, especially a clever use of the standard "Pretty Baby". As in so many WB cartoons, the score gets a laugh. But what's intriguing is the balance here between some cracklingly funny dialogue and a heck of a lot of pure pantomime; one couldn't exist without the other, nor should it. Every sentence counts--and so does every reaction, every take, every bit of movement. It's aimed 100% squarely at the adults in the '53 audience, yet small children can sense the silliness in the cats' bickering and the gags of the intruding neighborhood alley cats speak for themselves. I am a believer that such shorts can still be done, but brother, you've got to be good--better than good: you've got to be sharp, at the very top of your game. And I believe you have to know who you're making these for--to please yourself--assuming you're one clever, funny person. But it can still be done. sounds like a great cartoon, thanks for writing about it...wonder how come I've never seen it??? My favorite by Garth Williams has to be "The Sailor Dog". Not that you asked or anything! BTW, I think I made that actual framegrab for my friend, Matthew Hunter, a few years ago. Time flies! love the drawing, I really like the unfinished for some reason. wow, that was great! I said something unflattering to someone the other day about Friz, I admit it, and I am very very sorry. Truth is--in later years he made some truly horrible cartoons, no question; but judged by his best(and who of us doesn't want it that way, lol? )he's tops. I muyself was never a big fan of the repetitive Tweety/Granny cartoons at all--snore...one is fine--more? Uh-uh. But what I love about the things his animators did that they apparently didn't do much for toher directors(overall): all kinds of funny expressions and little goofy nods and grins...and yeah, he handled music very very well in his timing. I was sort of shocked to see he gets slammed by a lot of cartoon lovers, really. He ain't Clampett or Jones--but who is? "Sailor Dog"! Cool! There's just something about Mr. Williams' work...it's kind of intangible, really super-appealing, huh? -Chuck--thanks, man. I feel the same way! jenny thanks for the encouraging comment.much appreciated,i would love to eventually get into the animation field and the basics are a good place to start! you've got some wonderful work here,i will keep checking back for more! also,I live like 20 minutes from chadsford! !its very nice there. Hey Rickgo--that's right! I saw you lived in Philly(or that area); I lived on Pine Street for a little while away back when, and I still love that city...I try to go there (and visit Chadds Ford)at least every year. But this is where the animation industry is--well, mostly. If you really want to get into animation, keep at it and you will--on the east coast or the west! Hey Jenny I just wanted to tell you how much I enjoy and am constantly inspired/motivated from your posts. Whether it’s a post regarding a classic toon/animator or introducing a new artist’s blog I have always been left with my creative juices overflowing! Thanks alot and keep up the great stuff! I look forward to seeing what comes up next! You gave the cat Chuck Jones-like eyes in your drawing. That's why it looks different from the screen grab (notice I didn't say "worse", I said "different". Whether it looks like Mrs. Sylvester or not it's still a well crafted drawing). Yes, A Mouse Divided is a brilliant short. I've had it on VHS for years. The best line is at the end after the stork has accidently delivered Sylvester to Mr. & Mrs. Mouse: "Well, nothing like this has ever happened on my side of the family." Heh--glad you liked it, Barry. Say--I got a really funny one the other day-I almost mentioned it in my comment, but thought no one would know what I was talking about...I can't remember it now. But an obscene one?! Gracious! What are these nafarious machines up to? -Don't answer that! You're right, though--it looks verrry Jonesian--it is those eyes. Good call! While we're on the subject, it's interesting how the girl cat is designed; the weird little "chin"(or lack of one), tilt of her head, the nice fat tail(looks almost like an otter's)...she's also so beautifully animated, really nice stuff. 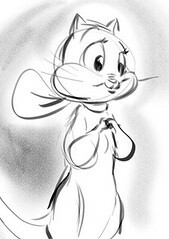 btw I just put that drawing of mine up as I wanted something to illustrate the post, knew I couldn't do Sylvester off the top of my head, and didn't think I'd find a "Mouse Divided" photo. Leave it to Thad to have provided the internet with one already! 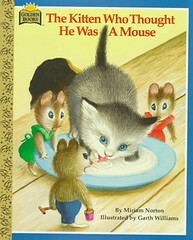 YEAH i agree i always thought the baby mouse just sounded like some dad trying to sound like a baby, not cute at all! oh well, a masterpiece anyway. -Right back at you, Marlo-babe: "Gaaagooooobabbabbaaaabah--CHEESE!" For some reason that line always slays me. Mel sounds like he isn't even trying here--I can just hear him at the end of the day after exhausting his voice on Sylvester and "da Baibee-sittah" cat, et al: " Hell, I need a drink--Let's go to the Smokehouse; screw it--what's that? Ya need a baby mouse? Sure, sure...let's go" Har!